Of all the major forms of media, the simplest seems the worst understood. 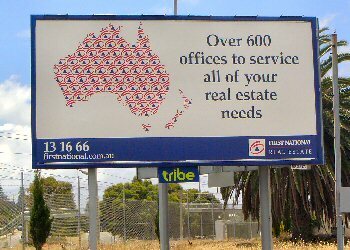 Outdoor advertising involves looking at an ad while you’re a substantial distance away and driving at high speed. Most viewers are driving a car; so they can’t look for long. A half a second maybe? Passengers might have two seconds. The rule of thumb is 7 words or less and no more than two design elements (i.e. logo + one picture). Less than twenty percent of the ads I photographed met this basic requirement. Include your product name in that 7 words. I’m assuming you want to mention your product. No cheating. If your product name has two words you’re down to 5. Include your web address if you’re using that. If it’s long it counts as two words. The job in outdoor is capturing the eye quickly. This requires excellent design and that generally means simple and minimalist. Let’s start with the best one. 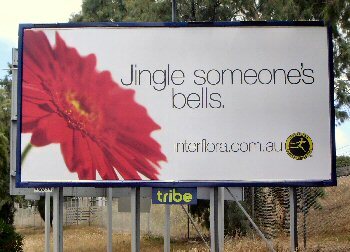 Clear and simple reminder that flowers are a Christmas gift. 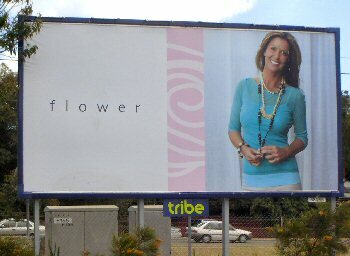 Not perfect (the word “interflora” is hard to read) but a sound strategy reasonably well executed. Although this meets the design rules it’s a very poor ad. It’s a tease but the image is not enticing. It’s a clothing shop just around the corner from the billboard. Would have been sensible to add “Napoleon Street” so that the punters have the option of finding it. Hard to read text, too many small confusing photos; a disaster. 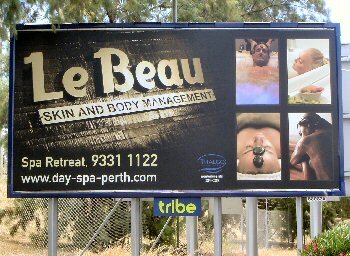 I drove past this thinking ‘what the hell was that all about?’ Could have been an ad for a horror movie. I’ve got a great idea: let’s turn our logo into wallpaper so that nobody can see it! In case you can’t make it out, the name of the business is First National. I don’t think I’d be relying on them to advertise my house.